Yet another jazz club closed down in Johannesburg this month. Open for less than five years, The Orbit wasn’t storied like older venues and it was located far from the townships where South African jazz was born, but it had succeeded in injecting vitality into the genre and Johannesburg’s nightlife. Yet even a full roster of old and young performers couldn’t save the venue from gentrifying rents. Hugh Masekela, whose own vitality made the genre mainstream in South Africa and beyond, performed here too. A year after his death on Jan. 23 after a long battle with cancer, Masekela’s absence is still felt. A bridge between the young and old, the exclusive and pop, Masekela’s popularity was remarkable because he was able to make jazz for the masses because he understood their lives. Soon after his death, one of Masekela’s songs became a political rallying call, as president Cyril Ramaphosa used Thuma Mina to trumpet what he called “a new dawn” in a South Africa reeling from the disappointment of corruption. It was a song everyone already knew, and tapped into the grief over Masekela and South Africa’s post-aparthied troubles. As most slogans, it was quickly parodied, but the optimistic sentiment of the song remains a message relevant beyond a political campaign. 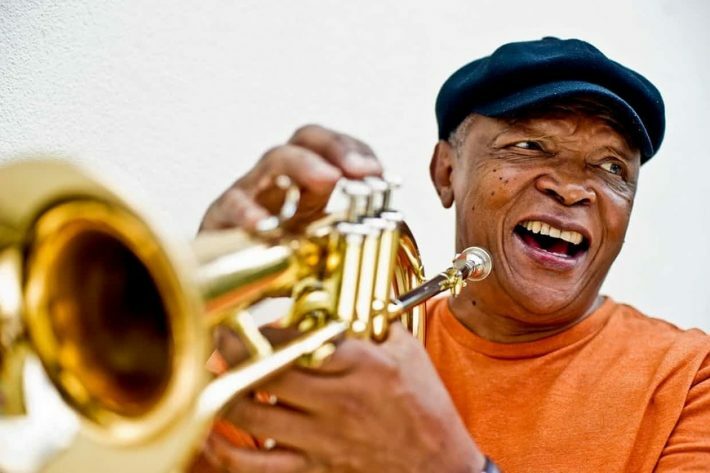 Released in 2007, Masekela had been home long enough, after three decades in exile, to see the euphoria of the end of apartheid and freedom blighted by an AIDS pandemic, political corruption, and the social ills of violence and addiction. The song, not strictly jazz but rather infused with the rhythms of South African gospel and the harmonies of choral music, faced all the socio-economic problems the country still had to solve. While some still debate whether music should take a political stand, Masekela’s artistry and life were intrinsically political. From performing in Sophiatown, a diverse neighborhood flattened by the apartheid government, Masekela’s life in exile always harked back to South Africa. When he was finally able to return, his personal battles with addiction and then cancer also inspired his music and activism. His canon holds many examples of music that reflected real life around him, like the hugely popular Stimela, which documented the lives of migrant miners. Like his idol Miles Davis, Masekela refused to be “yesterday’s guy,” and so his music continued to evolve, while he embraced young artists. Musically and literally, he hung out with kwaito, house and hip-hop, but jazz was always at the foundation. Through his genius, and the sheer force of his big personality, a trumpet solo lured new listeners to an old genre, when the genre risks becoming a “museum” of itself. In jazz’s own homeland, the music is no longer the soundtrack of poor black ghettos, and is now often more likely the background music of elite clubs in Scandinavia. This exodus is unsurprising—musicians have to play where they can get paid. So save for artists like Robert Glasper trying to maintain a connection to that other fast gentrifying sound of the inner-city, hip hop, jazz has become far removed the lived experiences of its originators.